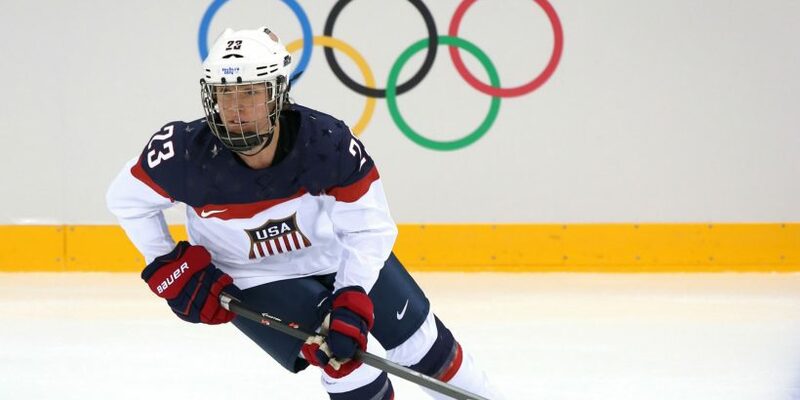 While she suited up for the USWNT for the 2015 and 2016 IIHF Women’s World Championships, where she earned her second and third career gold medals, respectively, she has not worn a USA jersey since. Following the Sochi Olympics, Picard returned to Harvard University’s blueline and emerged as a leader. As co-captain, she helped lead the Crimson to the 2015 NCAA Championship Final and was a finalist for the ECAC’s 2016 Defender of the Year her senior year. Picard, 25, kept training and pushing her skills forward. Leading up to the 2018 Olympics, the Taunton, Mass. native, helped prepare her former teammates and friends in a two-game series pitting the USWNT against Team NWHL. Serving as captain, her poise in the defensive zone and strength around the net stood out — and garnered her national team attention. This past November, Picard was invited to join Team USA as a member of its practice squad for the Four Nations Cup. She and fellow Sochi silver medalists Megan Bozek and Alex Carpenter were then invited to USA Hockey’s Women’s Winter Training Camp. On Jan. 25, all three players were announced as members of the Rivalry Series roster. Before the three-game series wraps up Feb. 17 at Little Caesars Arena in Detroit, Picard will be among the players looking to make a statement. The 2019 IIHF Women’s World Championship begins April 4 in Finland, and there are only so many roster spots up for grabs. With a strong series against Canada, Picard could soon find herself playing for a fifth medal at the Women’s Worlds.